The second most common form of arthritis—after osteoarthritis—is rheumatoid arthritis, which affects over two million Americans. Though it is assumed that the disease is hereditary and possibly infectious, little is known as to why it occurs. For whatever reason, the condition makes immune system cells move from the blood stream into the lining of joint tissue, which causes inflammation of the joints. 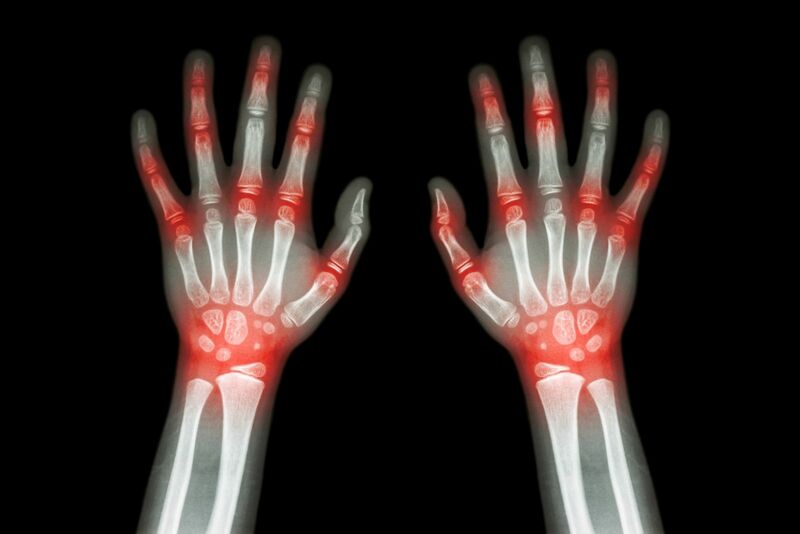 Redness and swelling are typical signs of rheumatoid arthritis. Rheumatoid arthritis is a systemic autoimmune disease, which means it can occur in numerous organs at once and forces the body to attack its own system, causing irritation in the joints and sometimes also in the skin, eyes, lungs, heart, blood and nerves. It is most common among middle-aged women, but can occur in children and older individuals, and men who have it often suffer more harshly than women. The disease is also symmetrical. Therefore, if a joint has been affected, the matching joint on the opposite side of the body will also show symptoms. This form of parallel attack makes it unique compared to other forms of arthritis. Those with the condition can experience symptoms that may include fatigue and anemia, as well as aching pain and swelling, for extended or brief periods and can often enter a lengthy remission with no symptoms or pain. However, since rheumatoid arthritis is considered chronic, it is not likely that those who currently have it will ever be cured. You may be experiencing pain from this condition that has kept you from working. This could make you eligible to receive long-term disability (LTD) insurance benefits. If the LTD company is not paying you the benefits you deserve or if your claim has been otherwise wrongfully denied or terminated, call Mr. Ortiz at 850-308-7833 for a free case evaluation.